Maybe its because of the 100th anniversary of WW1 this year, or it could be the political dysfunction we’re in right now, but lately I’ve been recalling the Christmas Truce of 1914. It seems to me that there are lessons in that moment that could apply to us today. 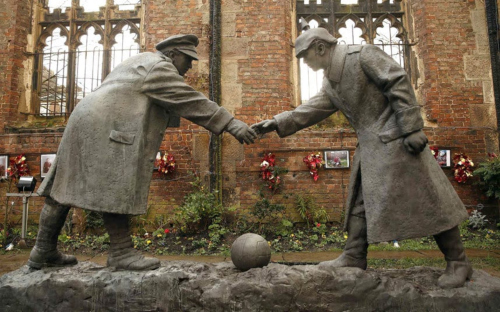 If you aren’t acquainted with the Christmas Truce, it happened at Christmas in 1914 when soldiers on both sides of the trenches quit firing at one another and climbed over the top to exchange holiday pleasantries, share coffee, and even engage in a couple games of football. What it says about us is that our basics instincts are shared. We’d prefer to have a happy, peaceful holiday with friends and family. Gifts are okay but truth is, in our hearts most of us grasp the greater meaning of the holiday. And in spite of our differences in religious beliefs, cultures, and backgrounds, we thrive when there is a live and let live attitude. We recoil when we are bullied or have our lives disrupted by powers that be who operate on greed and thirst for more power. There is a good 2005 movie about the truce, Joyeux Noel, if you are interested. But whoever and wherever you are, I hope you put aside your differences with others for the holiday, take a good look around, and realize what is important in life. Chances are, it is the simple thing not bought in a store. For there was nothing that happened in the Shepherd’s Field, or in the Bethlehem cave, or in the trenches of 1914 that came from a Black Friday sale. May the tune in your heart be merry, and a Happy Holiday enjoyed by you! there was just none to be found. even as the Ode To Joy choir was still singing. where public parking use to be. and the ice had the reindeer sliding like they were insane. by a pothole waist high! on all the video games and toys. standing in the road, distraught with fear. Lucy ordered her men into line. Christmas, it seemed, was going to be fine. In a small town in Illinois, that once claimed four hotels and now has none, there is a roundabout. It use to have a flagpole in the middle of it, but that too has vanished with time. At the end of WW1, there was a big celebration. People gathered at the flagpole, marched around it, and with pomp and circumstance celebrated the end of the war. Last month I was recalling my great-uncle telling me about this as we stood on the sidewalk near the roundabout. It came to mind because of the 100th anniversary of that event. The world was celebrating on a big stage but larger than life moments are constructed from smaller singular events in our lives. It occurs to me that roads – and places like that roundabout - say a lot about who we are as a species. And looking to our past is a good way to judge what I am saying here. For our history is ripe with roads changing our destiny or being referenced in culture. Would America be America if Lewis and Clark hadn't journeyed to the West Coast and back? That led to the Oregon Trail, the 49ers (not the football team, sorry NFL fans), and our coast to coast expansion. “All roads lead to Rome” wasn't simply a saying, it was a fact. 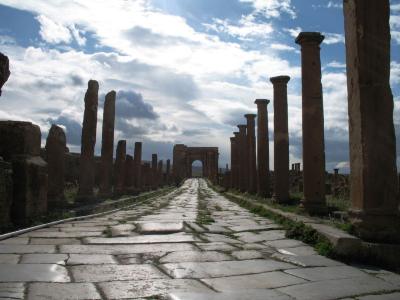 Romans understood that roads connect people and offer different cultures to come together in peace. Roads were also a source of power. Have a question, need an answer, travel to Rome to get it. Go to any ancient city in the Middle East and you'll find roads named for a destination. The Old City of Jerusalem for instance has the Jaffa Gate and the Damascus Gate where the Roman road runs alongside. But it isn't simply connectivity. Roads also represent exploration. We love to explore. Whether it is to find out what's on the other side of the Alleghenies or to drive down a back road we've never been on before, we love to make the trek. In the mid-20th century, Americans made it a ritual. Was there anything more American than the road trip? Just 'hop in the car and go' gave us travel centers where you could hitch a ride with complete strangers; convertibles so the wind could blow our hair as we went; “On The Road' so we could read about the lifestyle of those who never left the journey; the great Sturgis Bike Rally for those who prefer two wheels instead of four; and in some respect Disneyland where we just piled the kids into a station wagon (once owned by a Griswold) for a weekend visit to Mickey. Roads we build aren't simply for going to work or the quick trip to pick up a pizza, they are representative of our very instinct to go explore the world that exist beyond our horizon. They say Virtual Reality will offer the same experience without leaving the front room. That may be so but the people seen in V.R. won't be real like the ones around that flagpole a century ago. The only way to see and meet the real people is find out where that road in front of the house leads. The only way to do that is to get in the car and go. You can't be certain of what you'll find or experience but be assured, the journey defines you. On Armistice Day, C-SPAN-3 dedicated their whole schedule to WWI. Part of this was a live showing, with commentary as we watched, of the groundbreaking 1919 silent movie, The Lost Battalion. The movie had real survivors in the cast and until this film, Americans hadn’t seen warfare depicted in such a harsh fashion. The Smithsonian loaned C-SPAN the movie for this viewing. Scenes in the movie include actual Signal Corps footage and hand-to-hand combat. This was new and the historian commenting on the film described it as the ‘Saving Pvt. Ryan’ of its day. The silent film expert, Anjuli Singh, talked about how big budget and rare it was to be filmed, in part, on the battlefield in France where the unit had gotten cut off and surrounded. I was particularly moved by the inclusion of two Medal of Honor winners from the battle; the commanders, Lt. Col. Charles Whittlesey and Maj. George McMurtry. (Other Medal of Honor winners are in the film as well). I was struck by their presence because the commentators - especially, historian Edward Lengel, who has a book called, Never In Finer Company: The Men of The Great War’s Lost Battalion - did a great job explaining who they were. They were a couple of blue bloods. One a Wall Street broker and the other a successful N.Y. lawyer. Yet, they took command when the battalion was cut off, without food and water, and shelled by their own side. They helped the men hold on until relief arrived. But the commanders were never the same. The title of Lengel’s book comes from a phrase Whittlesey told McMurtry. In 1921, Whittlesey attended the Tomb of The Unknown Soldier ceremony. He told McMurtry he shouldn’t have come because he could hear the cries of his men. He watched this very film one night. Then the next morning, he boarded a ship for Cuba and when it got away from the shore, stepped over the side. It was more than he could take. The film itself was groundbreaking though it was shown in limited release at first and then re-released in 1926. Until WWI, the concept of sending troops to overseas was more or less a strange concept. There’d been the Spanish-American War a few years earlier, but that was nothing on the scale of WWI. And the cultural upheaval of throwing immigrants, and different economic classes in together, was totally new. I thought the commentators did a great job of explaining the cultural norms of the time. This was a good movie and really, for its time, quite the feat. And kudos to C-SPAN who had the grandson of Alvin York on preceding show to talk about his grandfather. York was involved in the same push as The Lost Battalion. It is where he won his Medal Of Honor. And if you don’t know anything of York personally, well, do a little reading. He passed up riches to help people after the war. And what he did earn, he gave to those charitable efforts. The one thing C-SPAN viewers came away with today was how much the participants detested this war. If you’re into silent movies, The Lost Battalion is a nice piece of cinema history. I’m sure C-SPAN will re-broadcast this viewing. But do yourself a favor and learn a bit about The Great War, on this the 100th Anniversary of Armistice Day. When I was young, I had a great-Uncle point to an intersection in a small town and explain how a flag pole had once stood there, and that when WWI ended, people had marched around it in celebration. Many of those people would soon be dead from the swine flu pandemic of 1918. In part, a consequence of that war. But for a brief moment, those town folks relished the peace. I listened today about another great-great Uncle, who had been caught in a German gas attack on the Western Front. He survived but was so crippled physically by the experience that basically he was disabled the rest of his life. WWI was so bloody that it produced what is commonly referred to as ‘the lost generation’. A whole swathe of humanity snuffed out of existence. And least we forget, that war spread the seeds for WWII. It has been 100 years since on the 11th day of the 11th month, at the 11th hour, fighting ceased. And while the current President saw fit to insult the memory of those sacrificed in that butchery, and dishonor the nation as a whole because he didn’t want to step out in a light rain, the rest of us remember. For if we don’t, if history loses relevance, then we fail to understand its lessons. If you don’t know much about the war, read at least one book on some aspect of it. But take a moment today to honor the fallen and those who lived with the scars ever after. For while its been 100 years, the fact there are still wars means we haven’t learned the lessons quite yet. New Hoodie. That time of the year. Season 3. Even though apparently, we all have to wait until next summer. This movie caught me off guard by how good it is and what clicked in this production. The audience was all abuzz leaving the cinema because almost no one guessed the ending before the credits rolled. However, it was easy to realize this was going to be a different kind of movie from the opening credits. That’s right. The opening credits. There was a retro feel to the title shots and at first I thought, is this going to be a late 60’s or early 70’s setting? Yet, the graphic work was modern. But what really backed up this story - which does take place in the here and now - was the music. Most of the soundtrack for this movie is French songs. The entire movie is in English. And except for one reference, there’s nothing in the script that says France. But those French songs keep coming and they work! It was an awesome choice by Director Paul Feig. I found myself humming one walking back out to the car. I’m not sure how the choice came about, but it is worth noting. The story is based on a novel by Darcey Bell, with a script by Jessica Sharzer. They had the audience eating out of their hand. Like I indicated earlier, this story is a constant series of turns in a huge mysterious maze. The performances are top-notch. Blake Lively and Henry Golding are outstanding. There is even a supporting role by Linda Cardellini who I haven’t seen in a project in a while. But this vehicle is driven by Anna Kendrick’s performance and she leaves nothing behind. Her versatility really shines in this movie. What I have always liked about Kendrick is her ability to find little quirks or personality traits to incorporate into the portrayal of her character. That extra layer makes it all the more believable. She comes off playing a Vblogging mom that reminds you of someone you know. By the way, the vblogging really works as a way to tell this story. This movie is probably going to be swamped by the sheer number of blockbusters being released between now and the holidays. Even though it is getting great reviews, who knows how long it will play. If you don’t feel like seeing another comic hero, or a reboot, then buy a ticket for this movie. 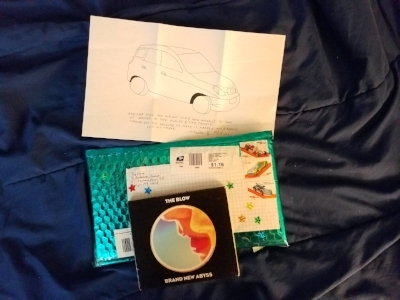 It is worth the time and money. A strong 5 of 5 on my rating scale. 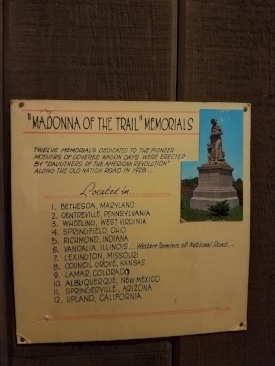 Two posts ago, I wrote about the National Road Museum in Ohio. 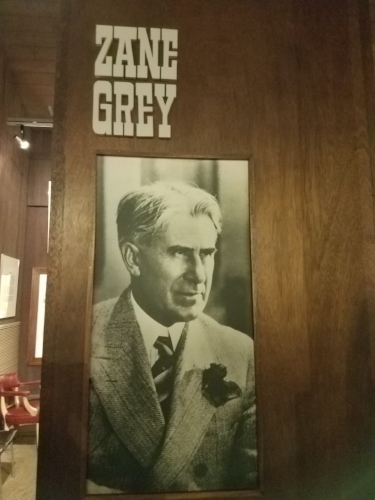 Part of that museum is dedicated to the author, Zane Grey, who was born nearby and lived part of his early life in the area. If you don’t know Zane Grey, it is safe to say a generation or two ago, he was one of the most popular writers around. Most of his works (not all) are Westerns. In the early days of holiday, almost all his books were turned into films and so actors like Randolph Scott and Roy Rogers made a living portraying his characters. I found it interesting, that while Grey made a guaranteed 25,000 a picture off the rights to his stories (a lot of money in those days), when he first started to write, it took SEVEN years for a publisher to sign him up. In the end, he was a popular writer who sold more books than Hemingway or Fitzgerald. Though, clearly, those two are better writers and are proving more enduring. Riders Of The Purple Sage was probably Grey’s most famous book. These are pictures I took at the museum. 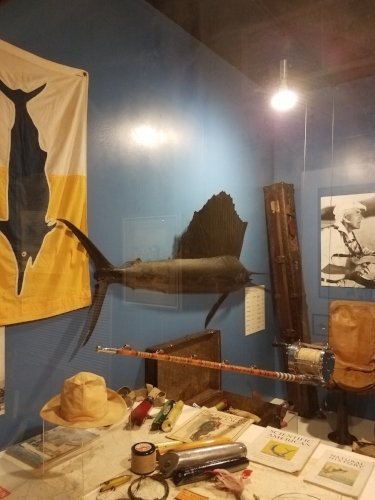 There is actually a large museum at Grey’s old ranch in Pennsylvania.